Wow! What an evening! We celebrated the inaugural World Numbat Day on Saturday 7 November at Perth Zoo, and what a celebration of all things numbat it was! We welcomed many Project Numbat members and numbat advocates, and we are grateful for everyone who joined us in an interesting evening of numbat knowledge and pleasant conversation over food and wine. Our speakers on the night were all experts in their field. Project Numbat President Tamara Wilkes-Jones opened the evening by giving an overview of the Committee's very successful year. This was followed by a very personal video message from Threatened Species Commissioner Gregory Andrews (follow this link for the video), who pledged his commitment to the numbat, followed by a talk from his Senior Advisor Sam Dutton. Mr Dutton acknowledged the importance of community groups such as Project Numbat in the success of conservation projects. Perth Zoo CEO Susan Hunt talked about the strong connection between the Zoo and Project Numbat. Over the past years many Zoo staff have been Committee Members of Project Numbat. Department of Parks and Wildlife Researcher Tony Friend demonstrated the importance of Project Numbat's fundraising for research projects. In the past decade, Project Numbat has contributed almost $60,000 to DPaW's research and surveys: a sum that deserved a spontaneous applause from the audience. Last but not least, Committee Member Renee Bauhofer took the stage, to present the very first 2016 Project Numbat wall calendar. All contributing artists received a copy to take home, and in the course of the evening many more calendars were sold along with other Project Numbat merchandise. As always, all proceeds will go towards numbat conservation projects. This successful first World Numbat Day already makes us excited for next year. From now on, we will celebrate World Numbat Day on the first Saturday of November. We thank all attendees and contributors who made this evening a success and we look forward to seeing you next year! If you have missed the opportunity to buy our own limited edition 2016 Project Numbat wall calendar, please visit our online shop. Visit the Williams Market this Saturday to meet Project Numbat! Project Numbat will host a stall at the Williams Market on Saturday 26th of September from 8am to 1:30pm. Marilyn Welch, coordinator of the Williams Market is pleased to have Project Numbat attend. “Their presence will add another interest to our local market that sells popular jams, pickles and cakes". You will be able to find out more about the Numbat, how and where to spot them, and what you can do to help its conservation. There will also be the opportunity to buy unique Numbat merchandise. Hope to see you there! Thanks to all of you who visited us on Sunday 6th September for National Threatened Species Day in Fremantle. The event was a huge success, thanks to the lovely participation of the other conservation groups. We managed to get the word out about the threatened species in WA, and the numbat in particular. A special word of thanks to artist Wendy Binks, who kindly donated the colourful Numbat Picture Board. Many happy faces enthusiastically posed as a numbat in front of our stall, before visiting us to find out more about the numbat's plight. We will be announcing the winner of our photo competition shortly! Order your 2016 Project Numbat Calendar now! Project Numbat has collaborated with some of WA's best artists and wildlife photographers to create a beautiful calendar showcasing our favourite numbat friends that you will love to have decorating your wall all year long! The price is 20 AUD each or 2 calendars for 35 AUD plus shipping fee. Australia wide shipping fee is 5 AUD for up to 3 calendars. If more than 3 calendars are bought, an extra 5 AUD is added for up to 3 more calendars. International shipping fees will be available soon. Click here to order your calendar in our shop! Join us on National Threatened Species Day! On Sunday September 6th, Project Numbat will be hosting its second National Threatened Species Day. We’re teaming up with a wide variety of other groups to help raise awareness about threatened species in Western Australia and beyond. Come and visit us at Kings Square in Fremantle (alongside the Mad Hatter Markets) from 10am to 4pm. Our mascot Nurla will be there, as will ten other environmental organisations. This is the place to be and to find out more about the Western Ground Parrot, cockatoos, oblongs and many more. And of course: the Numbat! Visit our new Numbat Gallery and share your numbat pictures! We are very pleased to present you our new numbat gallery. On this website we now have a separate photo gallery with a selection of numbat pictures. Please have a look and let us know what you think! Do you have a picture of a numbat you spotted in the wild, in the zoo or in an art work? Or did you create your own numbat art work? We would be thrilled if you would want to share it with us for our new gallery. All your pictures (with a short description of where and how you took the picture) are welcome at: info@numbat.org.au. Project Numbat for the first time will be attending the Beaufort Street Art Markets in Mt Lawley this Sunday from 9am – 1pm. Our stall will showcase the fine and unique numbat items we have for sale – all made by WA artists and some of which don’t appear on our website. We also have canvas art for sale featuring the numbat of course. So if you want to see these items up close and are looking for a distinctive gift, then please come by and don’t forget to say hi. Project Numbat is excited to attend this monthly event as art is another way of raising numbat awareness amongst our community. 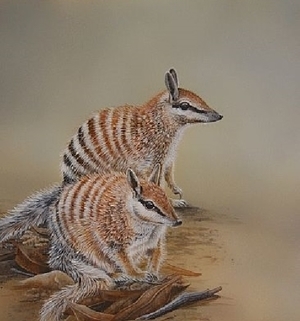 Two pieces from our collection of Numbat Art are currently on display in Pemberton. If you are heading to the Pemberton Fine Woodcraft Gallery, you can have a look at ‘Shouldn’t you be in bed?’ by Hazel Howie and ‘Numbat’ by Sharon Wormleaton. Both pieces are for sale. These two fine examples of Numbat Art will stay in Pemberton until June 1st. Click here for more information on the Pemberton Fine Woodcraft Gallery. Design An Ad for Project Numbat! Project Numbat has joined the Design An Ad Competition 2015 of The West Australian. This means that participating students from Primary and Secondary schools can now choose Project Numbat and create an advertisement based on our brief to draw attention to our organisation. Four winners will be chosen (2 Primary School students and 2 Secondary School students) and they will each receive a $100 cash prize. Students wishing to create an ad for Project Numbat can click here to visit a page where they can download the logo of Project Numbat and some beautiful pictures of Numbats for their ad. We look forward to seeing all the ads and we wish everybody good luck! Project Numbat's First Art Exhibition is Finished! Well that was a whirlwind of a month! The artworks have been taken off the wall and packaged up to be sent to their new homes. Thank you so much to everyone who helped out, all of the amazing artists, everyone who came to check out the exhibition and Little Creatures for a brilliant space. I think the whole event really amazed us with how well received it was and the huge turn out on the opening night. Most of the art works have been sold, there are a few that are still available, so if you feel you missed out on a piece you had your eye on, please contact us. Once again, thank you to everyone, hopefully now everyone can tell their Numbats from their Wombats! Project Numbat's first ever art exhibition "A Numbat is not a wombat" officially opened last night, and wow! what a turn out. Thank You to everyone who came down to say hello to us and buy some art. The artworks are on display for a month in the gallery space upstairs at Little Creatures Fremantle, so if you didn't get a chance to stop by last night then make sure to check it out. All of the artworks are for sale and can be purchase through the "art exhibition" tab of this website. Project Numbat is pleased to announce our first ever art exhibition! Opening night is January 8th and there are lots of fun things happening such as a raffle and appearances by Narla (our giant furry Numbat friend). If you can't make opening night, never fear; the exhibition runs for a month, All art works are for sale and proceeds go to helping Project Numbat continue their good work for the Numbats! Wild or captive born Numbats are fitted with radio collars each year by the Department of Parks and Wildlife to track their movements, gain important information on their dispersal in their habitat and their survival. In November and December 2014, DEC will be fitting a number of Numbats with radio-collars. The Numbats will either by wild caught or bred at Perth Zoo for release.